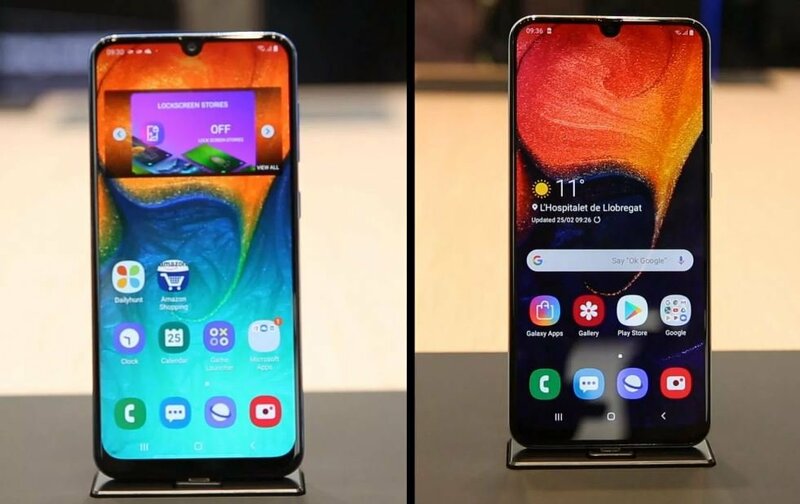 The just-launched Samsung Galaxy A30 and A50 phones are expected to be star performers in the mid-range smartphone market. Here are some of the features, and differences, in the two models. Let’s start with the Samsung Galaxy A30. It might be a midrange phone but the display is of premium quality: a 6.4-inch FHD+ Super AMOLED display. The dual rear camera setup will give you a 16 MP lens, and a 5 MP wide-angle lens. On the front, you’ll be able to take super sharp selfies thanks to the 16 MP camera. For memory, the A30 has 4 GB of RAM and 64 GB of storage, with excellent processing power from an Exynos 7904. Furthermore, there’s a rear fingerprint reader and 4,000 mAh battery with fast-charge support. The A30 gives you a whole lot of phone for not much money. But what about the Samsung Galaxy A50? How does that compare? Well, the display is the same: 6.4-inch FHD+ Super AMOLED display. But things get bigger with the memory and storage: 6 GB and 128 GB respectively. The processor goes up a level too, with the Exynos 9610. There are triple rear cameras: 25 MP, 5 MP depth sensor and 8 MP wide angle. For even sharper selfies, the A50 boasts a 25 MP camera up front. Like the A30, there’s a 4,000 mAh battery with fast-charge support, while the fingerprint reader is an in-display reader. No matter what you choose, you’re on a winner. The Samsung Galaxy A30 and A50 may differ in several ways, but they both offer excellent value for money.